The future of the Rothschild’s giraffe is still uncertain, with the population of this sub species falling drastically to less than 1100. The loss of this sub species is greatly attributed to habitat loss and poaching; and Projects Abroad is playing a crucial role in ensuring their survival. Our giraffe research monitoring programs went smoothly with the aim of providing an accurate and scientific overview of the ecology of the rothschild’s giraffe. The acquisition of the vehicle for Kenya’s Conservation project will improve the running of our ecological and research programs in Kigio Wildlife Conservancy. Our research on the activity pattern Rothschild’s giraffes with the objective of discovering how this subspecies spend their day without real predation risk is ongoing. During the giraffe research we have noted that during the day giraffe stay in open habitats and also areas of small patches of woodland. During these times of the day they forage less, ruminate, socialize and rest. They tend to wander far into the shrub lands and wooded habitats towards evening. They tend to split into smaller herds and mainly forage. The data from this study will yield more results on this phenomenon especially when combined with nocturnal observation. 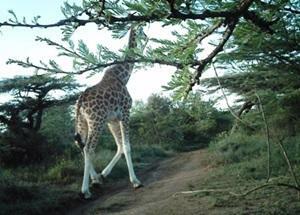 The camera traps project in the conservancy is ongoing; the use of this technique has been of great help in determining presence, abundance and density. The Kenya Conservation project is home to a wide variety of wildlife, including the rare and endangered Rothschild’s giraffe and home to two of the big five (leopard and buffalo). 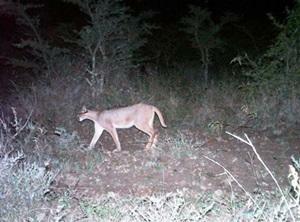 Hence camera trapping has been a valuable means by which to survey mammals both common and elusive. The data from the camera traps which are in operation for 24 hours when analysed, will yield unbiased information on activity pattern of the mammals in the conservancy. 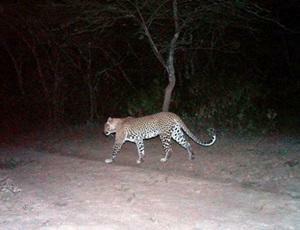 The camera shows the presence of a female leopard, I could not compare the body pattern, because it was a bit difficult because one picture was very close to the camera and well light by the camera flash and the other was not. Hence making it very difficult to do body pattern comparison unless with the availability of body pattern identification software. We are assuming that it is the same female leopard due to the size of the conservancy but there could be an overlap of territories. Our weekly bird’s survey for December and January continued to yield interesting information, our volunteers recorded some common species; Ring-necked Dove, Common Drongo, Common Bulbul, Pale Fly-catcher and also recorded the following migrant species; Willow Warbler, Fawn coloured Lark, Petronias, and Black-backed Cisticola. Several Nightjar individuals were observed but it is very difficult to identify which species as they are nocturnal and each species is almost identical. The results show the presence of the Afro-Palearctic migrants in the conservancy which is great news. We hope to monitor these important species over many years. Our tree nursery project is running well and as the dry season began in early January, the watering of plants has intensified to mitigate the high moisture loss to the dry air. The tree planting in the schools and neighbouring communities, which was halted will resume again in mid-march. The main activities in the nursery were geared towards propagation of tree saplings to be planted on the onset long rains. This was necessary so that we can plant the trees outside the conservancy when the moisture in the soil is high to ensure high survival rates. The volunteers, rangers and staff have been very instrumental in ensuring that the seedlings get enough supply of water throughout the week and even on the weekends! Kigio Wildlife conservancy has three species of Acacia, two trees (Acacia xanthopholea and Acacaia gerradi) and a shrub (Acacia drepanolobium). These plants are not only being utilized by the giraffes alone but by other herbivore species hence the browsing impact is high and can lead to over-utilization. Acacia xanthopholea which is the only one among the three whose number are low in the conservancy, this is attributed to giraffes among other herbivores de-barking them, leaving them with injuries that cause stunted growth or even the complete drying of the plant. This is why it’s one of native plant species which we are propagating in our nursery. The seeds have germinated and they are constantly being monitored and watered by the staff and volunteers. The saplings will be planted in the conservancy because it’s the giraffes most preferred browse species and is expected to increase the plant biomass percentage in the near future. This is also crucial in checking the rampant loss of these species due to intensive browse utilization by the herbivore community. The steps in controlling this species have been outlined as follows: identification, mapping their distribution using the GPS, and then manual removal. The invasive are put in a pit that’s one metre deep and covered completely with soil. Poaching is on the rise in Kenya and Africa as a whole, from the big species like the elephants and rhino. In KWC and its environs the warthog population is being decimated at high levels for meat both subsistence and for commercial purposes. The poaching pressures are from the northern and the western side of the conservancy. Volunteers and the rangers constantly monitor this ensure that the poaching is checked and any incursion is reported to the relevant authorities so they can be apprehended. The months of December and January had volunteers do lots of field work. The lesser the numbers meant a lot of work to cover for the few number of volunteers.